Quick! Buy water pistol stock! Water pistols look set to become this summer’s biggest fad for young and old alike, according to retailers. 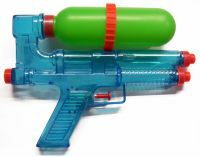 Amazon.co.uk says sales of water pistols have rocketed 850% this year, the biggest surge in sales seen in years. It comes as the heatwave is possibly set to bring the hottest day in the UK since records began. “Sales of water pistols are traditionally higher over the summer months, as one would expect,” says Paul Sanders, toy buyer at Amazon.co.uk. “But demand this year has really skyrocketed. We’re seeing a modern twist on old pastimes, and it seems that a whole new generation of kids and adults will be staying out for the summer with their water weapons in tow”. July 18, 2006 Posted by oldstersview | Uncategorized	| Comments Off on Quick! Buy water pistol stock! A prisoner broke out of jail to wish his girlfriend a happy birthday before returning later that day. Dragan Boskovic, 26, escaped from a prison near his hometown of Kolasin in central Montenegro, where he was serving a life sentence for murder, by overpowering guards and scaling a ten foot prison wall. He went straight to his 19-year-old girlfriend’s house but two hours later turned himself in to cops who had started a manhunt for him. 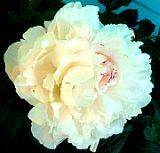 July 18, 2006 Posted by oldstersview | Uncategorized	| Comments Off on Ah, Dragan—you shouldn’t have. What’s next? Ads tatooed on your retina? July 18, 2006 Posted by oldstersview | Uncategorized	| Comments Off on What’s next? Ads tatooed on your retina? Mascot, icon, tradesman. 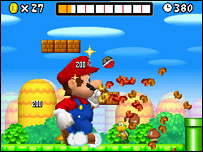 Life is good for the world’s most famous pixelated plumber. Having conquered the platforming world since his first appearance in Donkey Kong, the moustachioed mushroom gobbler has come full circle with an incredible DS adventure that harks back to the series’ 2D roots. Despite the title, the first 2D Mario game in over a decade offers nothing new per se, looking and playing exactly like the NES fodder that devoured our lives in the 80s and 90s. Shigeru Miyamoto’s time-honoured plot remains intact, as once again Bowser kidnaps Princess Toadstool, prompting Mario to embark on a rescue mission across the Mushroom Kingdom. A third of children in the UK use blogs and social network websites but two thirds of parents do not even know what they are, a survey suggests. The childrens charity NCH said there was “an alarming gap” in technological knowledge between generations. July 18, 2006 Posted by oldstersview | Uncategorized	| Comments Off on And this is a surprise?